Hotel La Chaumette sits just 5 minutes from the city centre of Privas. It offers air-conditioned rooms all equipped with bath or shower, cable TV and free Wi-Fi internet access. 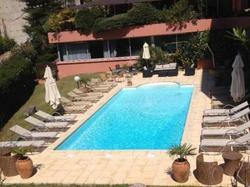 Hotel La Chaumette?s swimming pool sits in the garden and is surrounded by a furnished sun deck. The garden also houses a dining area and a children's playground. The restaurant serves dishes made from local products and a buffet breakfast of homemade products is available daily. Meals can be enjoyed on the terrace when the weather is nice. The bar is also open for afternoon cocktails or evening aperitifs. The restaurant is closed on Monday, Saturday afternoon and Sunday evening during the low season. The air-conditioned rooms include cable TV.